Primary bars above (black) and secondary bars below (spheres). Note:The Section Directory (below) provides access to other Sections on this site. A Site Diagram is available for section 4. The structure of section 4 provides insights into the structure of other section; these insights are an aid in understanding the functions of the navigation bars as represented in clusters in the Masterborder to the left and at the end of each page. A second, borrowed Site Diagram is accessible. The first cluster to the left in the Masterborder is a group of primary bars; primary bars provide access to chapters of this section. The second cluster to the left in the Masterborder is composed of secondary bars (identified by a colored sphere). Secondary bars provide access to other sections and to web sites. Navigations aids - Next Page, Back a Page, Up a Page, and Down a Page - are available at the end of each Chapter. They are an aid in moving along a tier, or in changing tiers. Movements among tiers is accomplished a tier at a time; always an Up or Down movement is limited by relationships between Chapters of different tiers. Commonly, more than one “child” Chapter is linked to a single Chapter at next tier upward; this “next Chapter” qualifies as a “parent” Chapter. On the other hand only one of the relevant “child” chapter will be linked to a “parent” Chapter, if movement is to be down to a lower tier; this Chapter will be the first of the relevant Chapters along the lower tier. The Up, Down, Next, and Back navigation aids will be accessible at the end of each Chapter (click here for orientation). 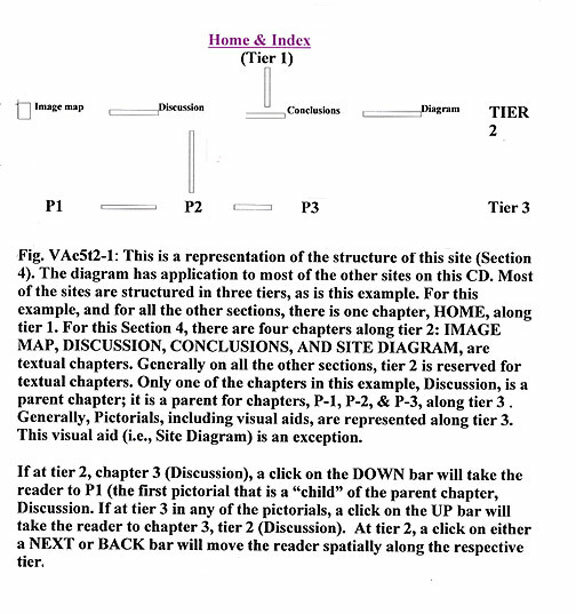 This is a three tiered site with a single chapter at tier 1. The second tier consists of chapters in which textual and pictorial presentations are intermixed. There is a single chapter along tier 3. In the Masterborder to the left, the bars of the first cluster are of primary type. In addition the cluster is of first level type; at tier 2, a click on a parent chapter (identified with a “-X”) will also provide access to the single chapter (first and only child chapter) along tier 3. In the next cluster of bars, each bar is identified by a colored sphere; these bars are of secondary type. Secondary bars in the Masterborder to the left and at the end of each page provide access to other sections and to web sites. At the end of the page, an Up button takes the reader from tier 3, chapter 7 (one chapter or page) to the parent chapter on tier 2 (C6). The Down button takes the reader from tier 1 to tier 2, or, if the reader is on chapter 6, a click on the Down button takes the reader from C6 to C7. The Back button takes the reader back to the previous page along tier 2 (movement is spatial rather than temporal). The Next button takes the reader to the next page along tier 2. This chapter presents an unusual fibro-follicular hamartoma in which the patterns of secondary follicles are mixed; anagen, telogen, and catagen patterns are represented in the secondary follicles. The 3 clusters to the left are composed of secondary bars: Access to other sections or web site. Primary bars to the right: Chapters of section 4.